Do you remember the moment when you learned how to play video games? When the joystick or the gamepad stop being a foreign object and started feeling like a part of your body? Maybe you do; maybe you don't. Brothers: A Tale of Two Sons is a game that puts you back in touch with that sensation, using an unorthodox control scheme to make you feel like your relationship with video games is starting all over again. Note: Last year, a small, unassuming indie game came out during the summer doldrums, bringing a fairytale art style and unconventional control scheme to players everywhere. 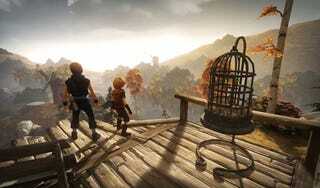 By the time 2013 was done, Brothers: A Tale of Two Sons was part of Game-of-the-Year conversations all over the internet. It's a game that stayed with me ever since I finished it so I wanted to re-share my nomination essay from Kotaku's 2013 GOTY discussion. And, if for some reason you haven't played Brothers yet, go do it. Developed by Starbreeze and Swedish filmmaker Josef Fares, it's a fairy tale that asks "what if you weren't good at video games anymore, but really needed to play one that was filled with shining sadness and melancholy sweetness?" For me, Brothers scrubbed away thirty some-odd years of video game experience, kinesthetically speaking, and made it so that I had to learn all over again how to trust that my fingers knew what to do. It uses a mechanical decision—where each analog stick on a gamepad controls one of the game's siblings—to express the sometimes harmonious, sometimes fractious dynamics of a relationship with someone you love. As you play, sometimes one brother will push ahead while the other lags behind. You'll move a puzzle element so they can go on separate paths or so they can come together to surmount an obstacle. Little Brother and Big Brother are trying to save their fatally ill father, the only parent they have left after the tragic, too-early death of their mother. Along the way, you're guiding them through a beautifully rendered fantasy backdrop where no words are ever spoken. Despite the fanciful mythological creatures or goofy gags you play through, the brothers' annoyance at and dependence on each other reminds how overwhelming their task is. And the game's dangers feel realer because you can't rely on the same ol' reflexes and intuition that's seen you through hundred or thousands of games. This short, downloadable game reminds you that, in a game, your fingers are capable of wondrous things. As you play, you realize how weird it feels to be controlling a character with these particular inputs. But, then again, any input for any game—x to jump, b to crouch—is an abstraction. What makes it work is the faith you put into it, just like the faith you put into a relationship: faith that another person knows what they're doing or that you know what you're doing. Brothers made me gasp with wonder and made my chest tight with emotion. Yeah, it invoked nostalgia but that's cheap. What's more valuable is how it used that nostalgia as a gateway to a deeper expression: the ties to the people we care for can be studded with thorns and the only way that anything beautiful ever blooms is by a careful, fragile co-ordination. Brothers reminds you why it was worth it to learn how to play video games because, for all their weird-at-first tactile demands, they can touch your heart and make you think about your life and the place of others inside of it.